Due to tram track reconstruction, the tram service will be suspended in the Staroměstská – Malostranská section in both directions, from Monday, the 9th of May 2016 (at cca. 0:30 a.m.) to Monday, the 23rd of May 2016 (at cca. 0:30 a.m.). Line No. 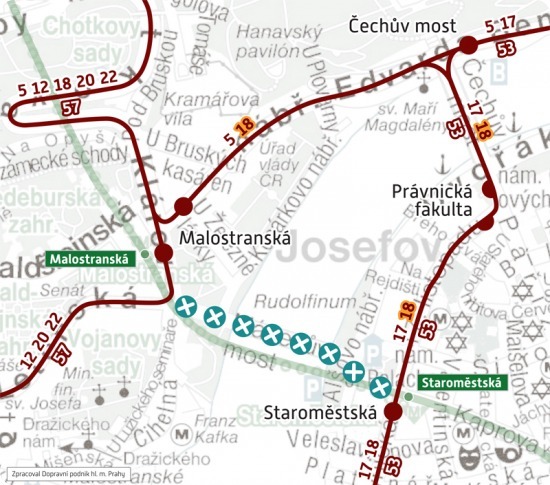 18 is diverted, in the Staroměstská – Malostranská section, via the Právnická fakulta stop. No replacement service is established.